IF YOU HAVEN’T ENTERED THE TREAT GIVEAWAY, DO IT NOW! I met the most adorable English Bulldog last week, Millie. 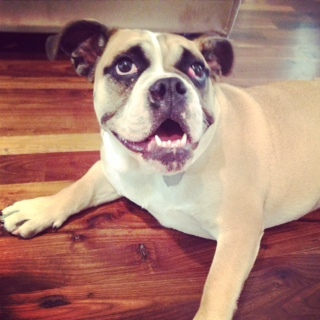 Millie, the English Bulldog, is about six months old and is a real sweetheart. 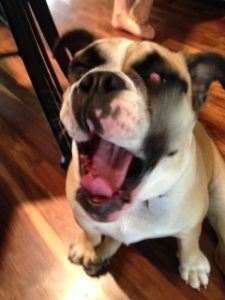 I found myself asking if the English Bulldog would have been a good pet for my family (if we hadn’t found Chewy the Affenpinscher). So today we’re going to look at the English Bulldog as a breed and see who they would suit. If you’re looking for a new puppy or rescue dog, especially looking for a bully breed, ride along! 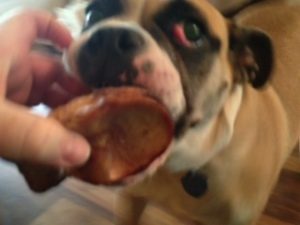 English Bulldogs like bones. Millie was one happy dog. Known for their loose-jointed, shuffling gait and massive, short-faced head, the Bulldog is known to be equable, resolute and dignified. A medium-sized dog, they are not your typical lap dog, but would like to be! … Said to have originated in the British Isles, the name “bull” was applied because of the dog’s connection with bull baiting. The original bulldog had to be ferocious and courageous, and almost insensitive to pain. When dog fighting became illegal in England, fanciers set to the task of preserving the breed by eliminating the fierce characteristics. Wow. So THAT’S where the Bully comes from! Bizarre. I know so little about this breed, or bullies in general. Millie wouldn’t let me get close enough to snap a good photo of her with the treats. Jones made her a happy, but protective, girl. Let’s take a look at the pros and cons of bringing home this medium size lap dog wanna be. Is that not the silliest, most adorable dog face ever? What cons could there be to owning such a cute little clown of a dog? Actually, plenty, sadly. Let’s look. That’s enough, right? None of that has to do with the dog’s behavior, but the English Bulldog has a lot of health and breeding issues which make it the perfect dog for someone with time, money and a passion for the breed. 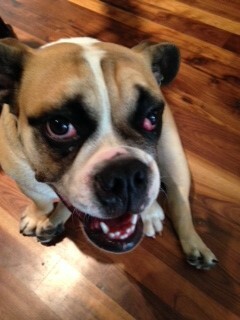 I hope this isn’t depressing for those of you with your hearts set on the English Bulldog. Better to be prepared than give up a dog because you didn’t know what you were getting into, right? They’re still gosh awful cute. Please, if you’re looking at the English Bulldog as a pet, or any of the bully breeds, do your homework. Know the breed inside and out. Check out potential breeders. Make sure you can see both parents. Get to know the breeder well and ask a ton of questions. Know potential health issues and ask about the blood lines in both parents. It’s that important. And what treats would the English Bulldog like? Bones! Big bones for strong jaws. 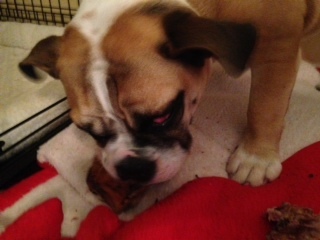 Miss Millie is young yet, less than a year by a long shot, and she’s already taken to bones. Also, Windees and Pig Ears. Pig Ears sparingly. Really, probably a lot of the Jones chews for this breed. Tomorrow check in to see how things are going at Blog Paws! If you’re reading this on Wednesday morning, I’m on a plane on my way to Vegas. By tomorrow morning I should already have plenty of photos and lots to talk about! And don’t forget to enter the treat giveaway!